If you wonder how to make chapati soft or softer, here is the best chapati recipe to make very soft Indian chapatis. 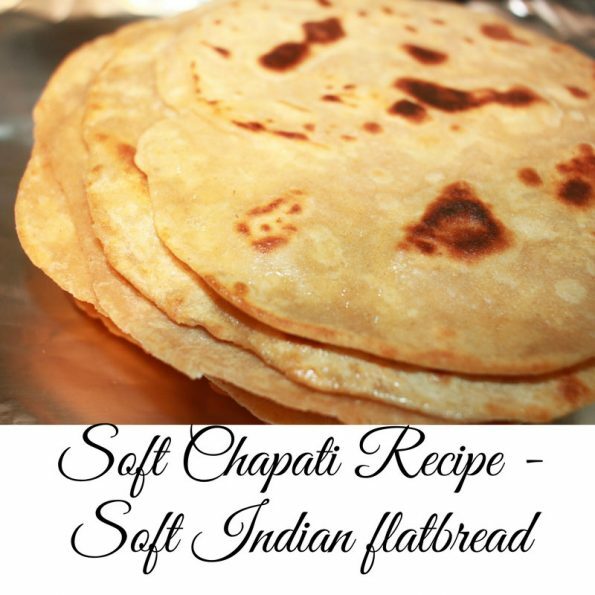 Soft chapati recipe for making homemade soft Chapatis or Indian flat breads which are almost daily made at homes in North India. Chapatis are the most popular and basic unleavened North Indian flatbread without yeast which is very commonly enjoyed in both North India and South India. Chapathis are usually enjoyed for dinner as well as breakfast and also lunch along with yummy curries as a side dish. In South India, chapatis are not made that frequently, but they still find a place in the dinner table for about 2 to 3 times a week on average, if not daily. I always used to wonder how to make chapati soft and how fast my North Indian friends make chapatis at home as this is a daily bread they enjoy. To me, chapati making doesn’t come that easily and it used to take a while to make them at home. However, with experience over time, I managed to learn to make chapatis somewhat quickly (still I take around half an hour to make around 10 to 12 chapatis from scratch). As I mentioned earlier another issue I faced while learning to cook chapatis was that it used to turn out a bit hard and I wondered how to make chapati soft. I found a solution to this by using warm water to knead the dough instead of cold water. Adding a little warm whole milk or yogurt (by adjusting the amount of water in this case) will help too, but this is optional. In fact, the more the hot water you use, the dough will turn out more soft. You can use a spoon to mix the flour with the hot water if you can’t handle the heat and knead the dough with your hands as soon as it is cool enough to handle. 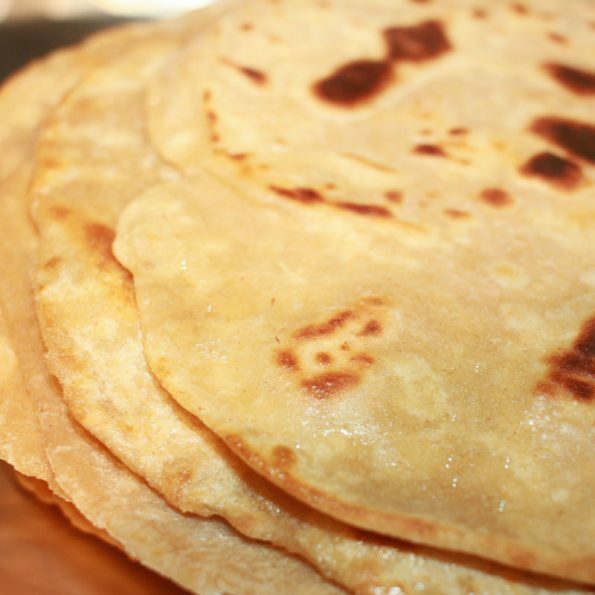 Even if you use warm water to knead the dough, you can make your chapatis soft. Just make sure to never use cold water. Another important thing to make chapatis soft is to knead the dough properly until a smooth and soft dough is obtained. If you use warm or hot water as I suggested above, you need very little effort to knead the dough properly, as this will make the job very very easy. 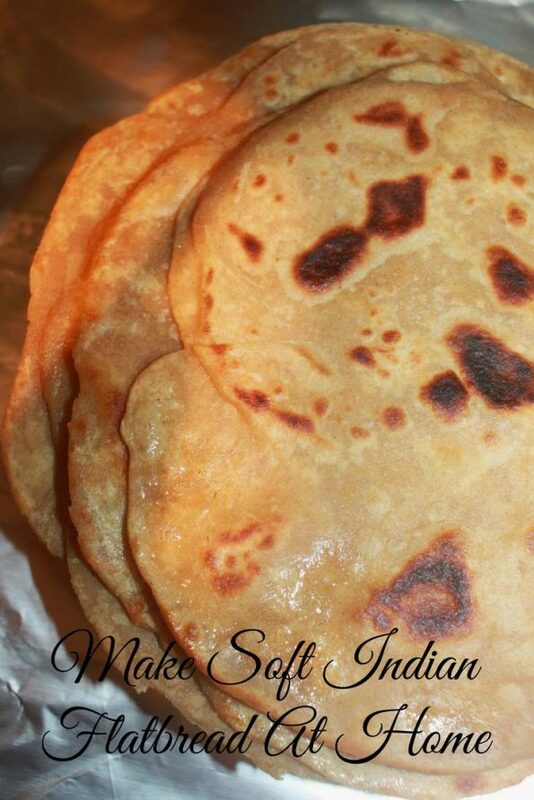 So here is how to make chapati soft by making the perfect chapati dough at your own home. Chapati (chapathi) is the most popular and basic unleavened flatbread from the Indian subcontinent and following the instructions and tips from this easy and soft chapathi recipe, you can easily make delicious, soft chapathi at home. In a bowl, mix together the flour and salt. Add the 3 tablespoons of oil to the dough and knead again to form a very smooth and soft dough. Let the dough sit covered for at least 20 to 30 minutes for best results. Make round balls from the dough, try to make almost equal sized. Take each one of the balls in your hand, press it gently between both palms to flatten it a bit. Dust both sides of the flattened ball with some flour and roll it using a rolling pin and board, to form the chapati. Heat an iron pan or non stick pan, grease it with oil (or ghee or butter), and place the chapati on it. Cook both sides, by flipping the chapati. You can add little oil, ghee or butter to make the chapati (while cooking the chapati in the pan) to make it more delicious. Chapatis are ready to serve with butter, ghee, yogurt, raita or any chutneys or any side dish as you wish!